One of Texas A&M’s most decorated passers, Gary Kubiak was drafted in the 8th round of the 1983 draft by the Denver Broncos. A career backup to perennial AP John Elway, Gary would come in and get occasional spot playing time playing intelligent football. 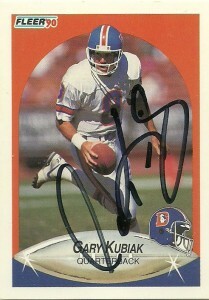 After 9 seasons with the team Kubiak would retire after 119 games and only 5 starts after 1991. His alma mater would come calling and Kubiak would coach runningbacks at Texas A&M for two seasons in 1992 and 1993 before he returned to the pros studying with George Siefert as the quarterbacks coach for Steve Young in 1994. Mike Shanahan was looking for an offensive coordinator and hired him in 1995 where he worked extensively with ironically… John Elway, the former quarterback he backed up. 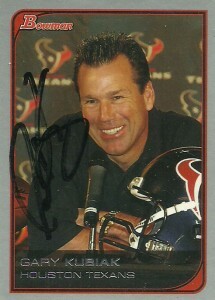 After a ten year stint there Kubiak, was hired as the second coach of the Houston Texans in 2006. 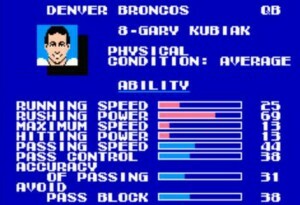 A Houston native and at one point an unabashed Houston Oiler fan, Kubiak is a tireless coach and offensive mastermind. Gary would guide the Texans to their best record ever, (9-7, 2009) most prolific offenses both in yardage and scoring, and almost into the playoffs, but as 2010 came to a close after 5 seasons, the team had yet to see that vaunted playoff appearance.